In two days, on 27th of March, the second buyback of the GET Protocol will run its course. In this blog, all the numbers relevant in this buyback will be disclosed. The rules of the auction have been explained in previously published blogs on the subject. Please pay close attention if you are planning to participate because as soon as you send GET to the buyback/tranche address there is no way of canceling or editing your transaction. Participation in the buyback auction is final. Make sure you fully comprehend the auction rules before participating! As last time the GET Protocol team is still in process monitoring the buyback process actively. While some aspects of the buyback are automated, the overall process is still relying on human confirmation/control. As was the case with the first buyback it might take up to 72 hours after auction finalization for the participants of the auction to receive ETH or GET. For both accepted as rejected GET, the participant will not immediately receive ETH or GET after the auction is finalized. The swaps and returns will be processed within 72 hours after the auction has been declared completed. Be aware of this latency! Moving forward we will aim to fully automate and decentralize the reverse Dutch auction process of the GET Protocol. For now control is preferred over ease of use. Assuming all the details and rules of the buy-back are clear to the reader, this article will proceed in listing the concrete GET demand, lock and times. With the market price of GET being below the guaranteed exchange rate; this means the auction will start with the ETH equivalent of €0.50/GET. Ethereum was locked today(at 14:00 local time) at €119.51 EUR/ETH. On behalf of our clients, we exchanged €36,055.40 for ETH. Thus; the auction will buy back 300.7 ETH worth of GET in a progressively increasing Dutch auction accessible for the whole open market. The first price tranche will start with on the swap rate of 0.004183750314 ETH/GET. Each price tranche will last 10 minutes. The swap rate of the next tranche will increment the previous price tranche with +18% until the total ETH demand is filled. All GET sent to the buyback address that is accepted will be swapped for ETH within 72 hours. The participant will receive the GET in accordance to the swap rate of the price tranche in which their bid was confirmed on the buyback address. Be aware of this latency! All GET sent to the buyback address that was either too early or too late will be returned to the sender within 72 hours of the auctions close. Be aware of this latency! That is all you have to know! Below I will list several important rules that already have been stated in previous blogs but are important to underline once more. The auction will start at 1 PM +0 UTC (EPOCH: 1553691600). If you are in the Amsterdam timezone (+1 UTC) the first tranche will open at 14:00 (2 PM) local time. First come, first serve! The duration of the buyback depends on the number of participants send GET to the buyback address. The buyback auction can last 18 hours or 10 seconds. The duration is a factor that is fully at the grace of the open market, not us. There is no slippage when your GET is accepted at a certain price tranche. If the time-stamp of the block in which the transaction from your wallet to the tranche address falls within the price tranche, the GET you sent will be swapped for that swap rate fully. The address a participant sends his or her GET from to the buyback address is the address to which the ETH or GET will be returned. Do not send GET from an exchange address as it is unsure if the ‘deposit’ address of your exchange wallet is the same as ‘from’ address. MAKE SURE YOU CONTROL THE PRIVATE KEY OF THE WALLET/ADDRESS YOU USE TO PARTICIPATE WITH. To prevent spamming and gas wastage the minimum participation amount for the buyback is 50 GET per participant. If a participant sends less than 50 GET it will be burned. 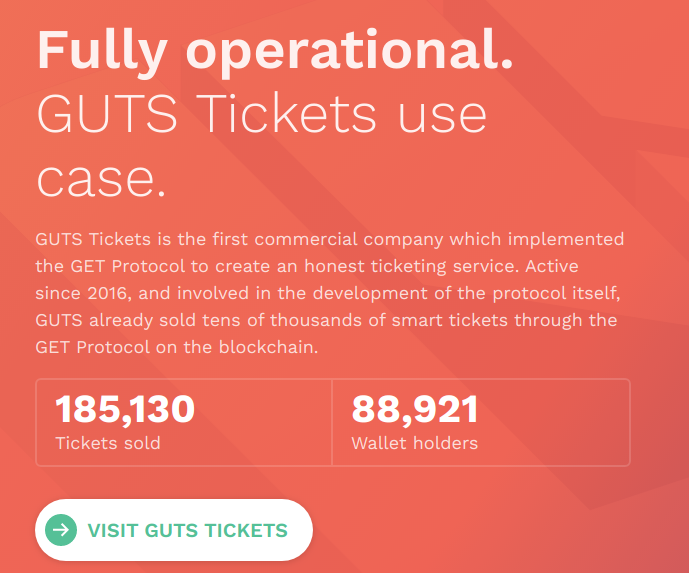 All details of the buy-back (and the progress) can be checked, verified and tracked on the website of the GET Protocol at https://get-protocol.io/. Questions? Ask us (or one of the team members) on Telegram. Check out our new website! Our download the GUTS Tickets app on iOSor Android.